Last year, while I was pregnant with baby O, I decided that, in anticipation of the lack of time I would have for blogging, I should pre-write some posts so that I would have ones prepared for holidays and special events. 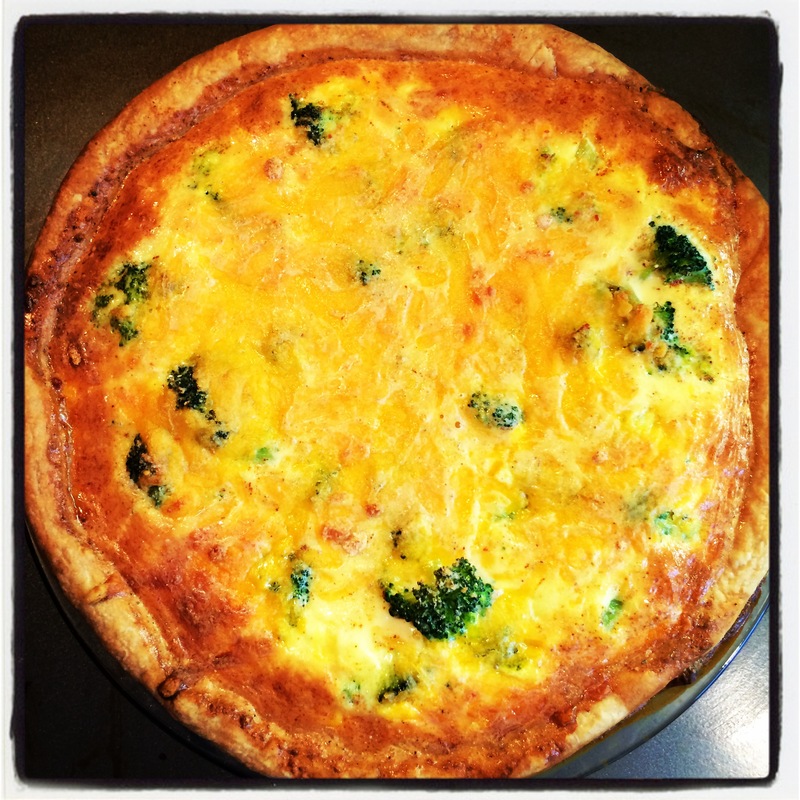 When I set out to make this quiche for Mother’s Day last year, I really had no idea how much would change by this Mother’s Day! Needless to say, I’m glad I planned ahead. 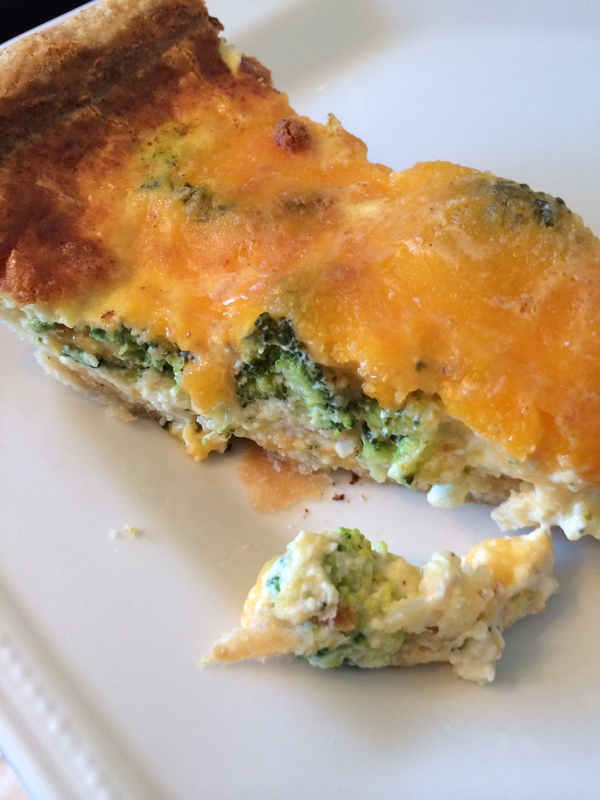 The nice thing about this quiche is that it can be made in advance, so if you’re hosting Mother’s Day brunch but still want to be able to relax, you can make the dough up to 3 days in advance and assemble and bake the quiche one day in advance. I did the dough and quiche all the day before, and it reheated perfectly. Quiche is my cooking nemesis. I have a habit of totally destroying quiches – I have no idea why, but no matter what recipe I use, it’s almost always a complete disaster. Despite this, I’ve been determined for some time to find and adjust a recipe that is next to impossible to ruin. So, if you’re hesitant to make this because you think it seems too complicated, have no fear! It has passed the test, at least for the most part. The only snafu I had was that there was too much custard for the pie dish, and so I had a small issue with overflowing that I saw happening in slow motion and was able to contain before this became the quiche disaster of 2014. If you don’t have a really deep pie dish (I used a standard one), then I would recommend putting some or all of the broccoli in before adding the custard so that you’re better able to judge how much room you have. You may have custard left over. The only other adjustment I would recommend is that if you’re not REALLY into garlic, you are probably better off using garlic powder instead of the fresh cloves. It will spread the flavour out a little more, rather than having some very garlic-y areas, and some areas lacking garlic. Personally I’m a garlic fan and so I will be making it again with the fresh garlic. Happy Mother’s Day to all, and especially to my amazing mom! First, prepare the dough: blend together flour, butter and salt in a stand mixer using the pastry hook or paddle attachment just until the mixture resembles coarse meal with some small lumps of butter. Drizzle 3 tablespoons of ice water evenly over mixture and gently mix until incorporated. Squeeze a small handful; if it doesn’t hold together, add more ice water, about ½ a tablespoon at a time, mixing in between each addition and testing again. Do not overwork the dough! 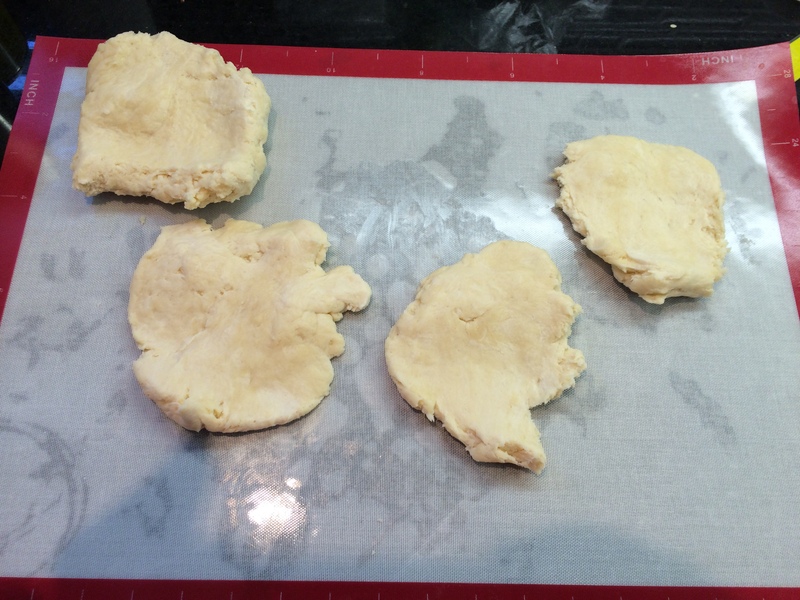 Place dough onto a lightly floured surface or a silpat mat and divide it into 4 portions. With the heel of your hand, smear each portion once or twice in a forward motion to distribute the butter. Gather the sections back together, press into a ball, and then flatten slightly. Wrap the ball in plastic wrap and chill until firm, at least one hour or up to 3 days. Preheat oven to 375 with the rack in the middle. 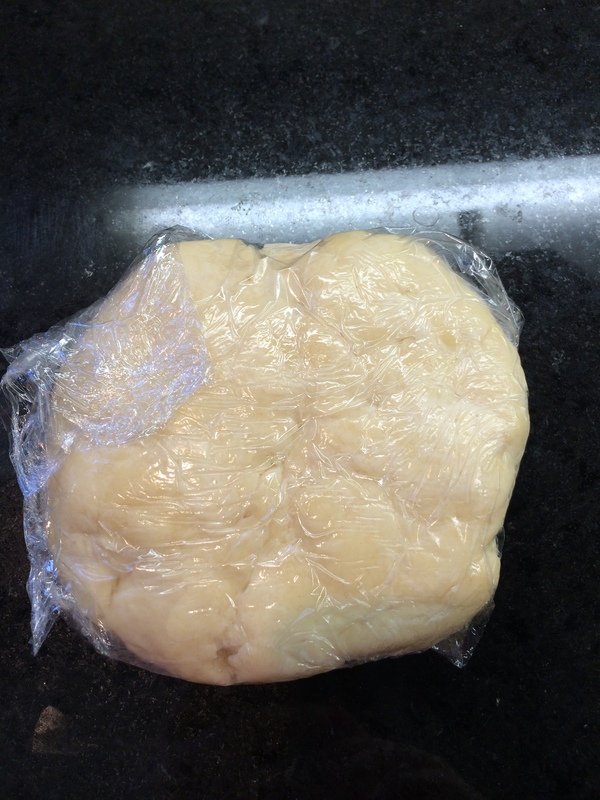 Using a lightly floured rolling pin, roll dough out on a lightly floured surface into a 13 inch round. Fit dough into a 9-inch pie plate or round fluted tart pan, letting excess hang over the edge. 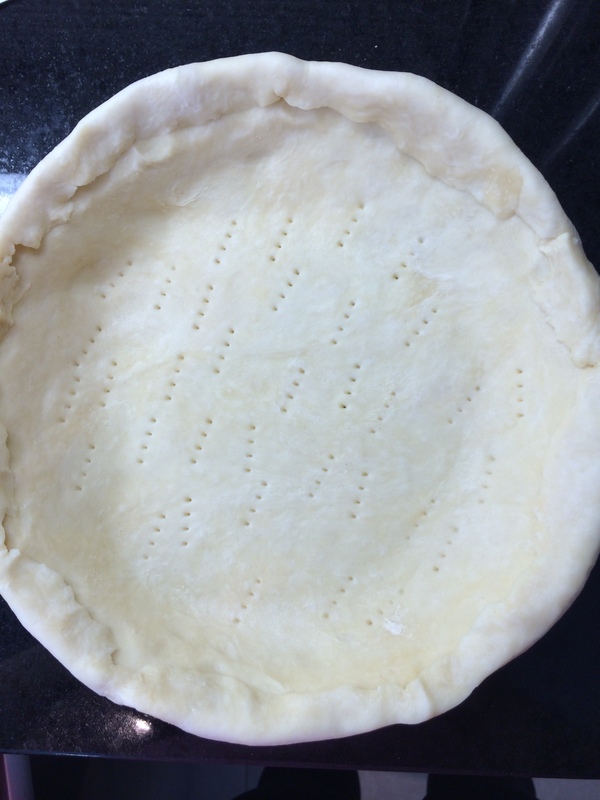 Fold the excess inward and press against the side of the pie plate to create a thicker crust. Prick the bottom of the crust all over with a fork, and chill until firm, about 30 minutes. Line the pie shell with tin foil and fill it with pie weights or dried beans, to prevent the crust from puffing. Bake until the pastry is set and the edge is pale golden, about 20 to 25 minutes. While the shell is baking, cook broccoli in a pot of salted boiling water for 4 minutes. Drain broccoli and rinse under cold water to stop cooking, then remove to paper towel to let drain and dry completely. Remove crust from oven, carefully remove foil and weights/beans, then return to oven for another 15 to 20 minutes, until crust is deep golden all over. Remove from oven. If you are using the fresh garlic cloves, mince and mash them with a pinch of salt until you have a paste. In a large bowl, whisk together the garlic paste (or the garlic powder), eggs, half & half, nutmeg, cayenne, and ¼ teaspoon of salt until smooth. 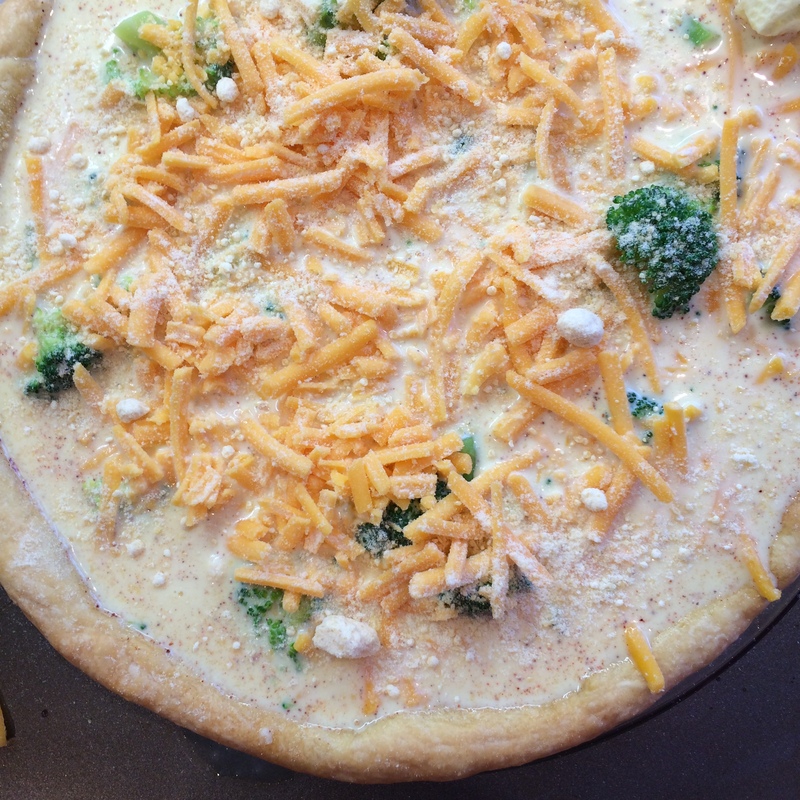 Place about half of the broccoli into the baked pie shell, then pour in filling, and add in as much of the remaining broccoli as possible without overflowing, then sprinkle with the two cheeses. Bake quiche at 375 until custard is just set, about 45 to 50 minutes. The centre will be slightly soft, but will set as it cools. Cool at least 20 minutes. Serve quiche warm or at room temperature. 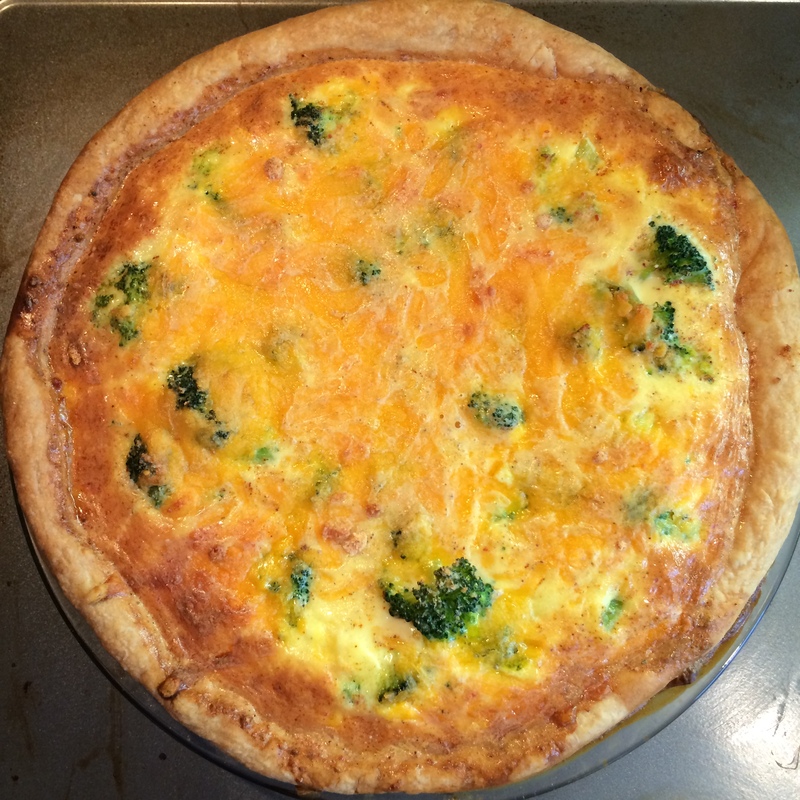 If you are baking ahead of time, reheat the chilled quiche at 325 uncovered for about 25 minutes.